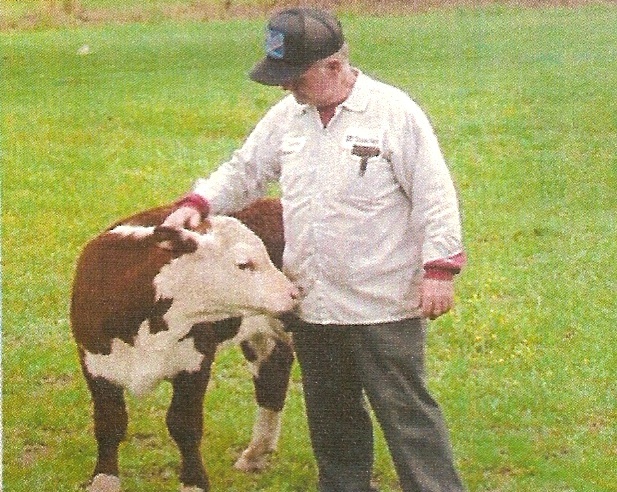 Gene Timmons was my best friend and Underwood Farms’ first farm manager, from 2000-2005. Gene taught me about cattle and about farming, and he oversaw the farm from the purchase of our first ten cows through our expansion to the current herd size of 150 dams. Gene Timmons was the most kind-hearted person I have every known. He loved helping others, and he never asked for anything in return. His passion was taking care of cattle, and the cattle knew it. Cows naturally liked Gene. Gene lived across the street from Underwood Farms at 17075 Reva Road. He kept a little 4-acre field in the front of his house that was used for his pet steer and the orphan calves. Any time a calf was born to a mother that did not have milk or that died during calving, the calf would go to Gene’s. The calf would literally become his pet. No matter how poor condition the calf was in, Gene prided himself on never losing a calf. They all recovered, and the females all went on to be cows themselves. In addition to his time on the farm, Gene worked for Quarles and a predecessor company, LR Waters, where he delivered fuel for 42 years. Gene was a great employee and genuinely loved his job. He “retired” in 2004, but he continued to work part-time, bordering on full-time. The only reason he retired was because of his failing vision. When I first bought the Underwood Farm at Reva from the Gore estate, I did not know anything about farming. I met Gene in late-April 2000, when I was walking the property with my brother Chris. At the time, I was working in both Connecticut and Northern Virginia, and I wanted to buy a beautiful piece of land with an old house on it. Gene drove down the farm drive towards the Gore house, and he came across Chris and I just across the culvert crossing the property’s main stream. He stopped and asked us if we were looking to buy the property. I told him I was considering buying it, and he asked me if I planned on putting houses on it. I told him that I wasn’t, and I didn’t know what I would do with it. He suggested cattle, and he promised to help if I decided to buy cattle. Two months later, after I bought the property, I came to the Gore House, where I would soon live, and Gene was mowing my lawn. I hadn’t asked him to mow my lawn, but the grass was getting high. Gene continued to mow the lawn for the next four years, always without being asked. When I bought the farm, the fencing was approximately 50 years old, and it did not hold cattle very well. Gene and I spent weekends building new fencing, and we ran more than 2 miles of barbed wire fencing over the next four years. We also built the bull pen and corral at the White Barn. Gene taught me to drive a tractor, and he loved bush-hogging. For the first two years, he and I (primarily him) cut over 100 acres of pasture twice a year with a 6-foot brush cutter. The process was so slow that we practically had to start the second cutting when we finished the first. In 2002, I bought a Kubota tractor with a cab, and Gene loved any reason to be in the tractor cutting or feeding hay or anything else. Gene and I spent literally hundreds of weekends together working on the farm. We talked about a lot of things, but usually the topics were cows, trees, and grasses and the fuel market. Sometimes, we’d discuss women or politics. Gene was frustrated with local politics, and his frustration first kindled my interest in running for local office. When I met Gene, he had four cows at his house. They soon moved to the farm, and his house became the infirmary for orphaned calves. The four cows were named Peaches, Pearl, Cher, and Jewel. Of the four cows (all calved in 1998), in 2009, three still reside on the farm and produce great calves every year. Gene’s favorite two cows were Peaches and Pearl. In 2008, Peaches and Pearl were bred to Lamp (EEH Lamplighter 21). The two calves, Pamp and P2, are exceptional heifers that likely will be at Underwood Farm for the next couple of decades. In 2009, Peaches and Pearl both had steers, but in late 2009, Peaches has a great-looking heifer calf from EEH Lamplighter 25. Both Peaches and Pearl have been bred to an Angus bull for 2010, and I know Gene would be eagerly anticipating the calves. In 2006, at the age of 67, Gene’s health began to decline rapidly. At first, he was frustrated by an unsuccessful cataract surgery that left scar tissue over both eyes. Then, he had “heat strokes.” Then, he began to be physically infirm and weak. I would take Gene across the street to see the cows, but his interest was not the same when he could not feed them and work with them himself. Underwood Farms would not be the same without the contributions of Gene Timmons. Without Gene, it’s possible that our farming operation would not exist. Similarly, my involvement with cattle, local 4-H, and even local politics all stem from Gene. For five years, he was my best friend and coworker, and his contributions have survived him.